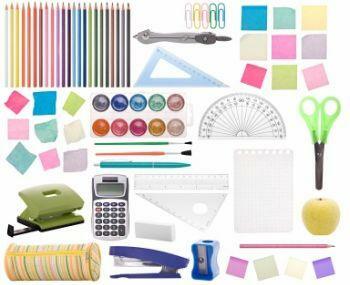 There's no shortage of cool school supplies for girls. Top designers and trends have trickled down from their fashion roots and have carried merchandise into the stationary, backpack and school supply world. Whether you're a parent of discriminating taste or if you're a teen heading back to school and want to dress to impress, the following cool school supplies for girls are sure to turn heads. Forget plastic zipped pencil cases and primary colored folders. If you need to up the cool factor, step outside the box and go with a character, lifestyle or designer trends in a hip variety of school supplies. Pencil cases: Whether they snap in your binder or get stashed in an oversize tote or hobo, handcrafted pencil cases have a unique and urban charm to them. Rather than mess with dated vinyl, go green and support the race to save the enviornment! An artistically crafted pencil bag like this Lama Li Eco Hemp Bag from European Paper is sure to turn heads. Pencils: While you're busy minding your arithmetic, a fashionable pencil is sure to keep you focused on the task at hand. Available in an assortment of sparkly dots, moon shapes, game themes and tie dye, these customized pencils, available from Geddes may just be too cool for school! Erasers: Sushi anyone? You can glamorize any mistake with a sushi roll eraser. This set of sushi erasers made in Japan are so impressive and cool, your teachers won't even notice your slip ups! Lunch boxes: Lunch boxes are still cool. Show the world you're hip with your own vintage-inspired, Yellow Submarine box. Perfect for packing a sandwich, a juice and a few midday snacks, these cool boxes will wow the lunch crowd. Paper: It's cool to save trees! Although most academic paper will be ruled and performated as per the teacher's instruction, there are green or recycled papers available. Check with your teacher about assignment appropriate paper, but make sure to keep your own personal notes on a cool recycled pad. Book bags: Need a cool bag? Look no further than these hemp shoulder bags. These messanger style books will stay cool even when your books are long overdue. You don't need to spend a fortune to gather a few cool supplies. Book jackets and bookmarks can be made at home from recycled brown grocery bags. With markers, stamps and a wee bit of creativity, the sky is the limit when it comes to school supplies. If you have an interest in fashion or design, embrace your passions and take your supplies on a couture level with ribbons, baubles and bows. Finally, once you've gathered a cool and unique set of supplies, you'll need to mark your turf to keep would-be sticky fingers off your precious goods. Invest in a secure locker lock and keep supplies out of reach and avoid leaving your posessions unattended. If you crave self-expression, fashion, and have a keen eye for detail, school supplies can be your daily muse!